In Nightmares from the Deep: The Cursed Heart, you take on the role of Sarah Black, a museum owner whose daughter has been kidnapped by an undead pirate. The pursuit of the kidnapper will lead you to a mysterious forgotten island full of deserted, moss-covered relics of the Golden Age of Piracy. But only the light of the full moon will reveal the true nature of the island, and the gigantic skull-shaped rock at its center. What happened on the island before your arrival? What kind of evil could make a rotting ship sail once more? Who is the undead Captain Remington? You will have to learn for yourself, by delving into the secrets of the grim, forsaken Skull Island. That sums it up pretty nicely; there was actually way more plot than I was expecting from a game like this. I’ve never played a hidden-object game with this much story besides Everlove (and that was more of a choose-your-own-adventure with occasional hidden object scenes). The beginning of the game takes place in the museum, which is also where you get a tutorial. 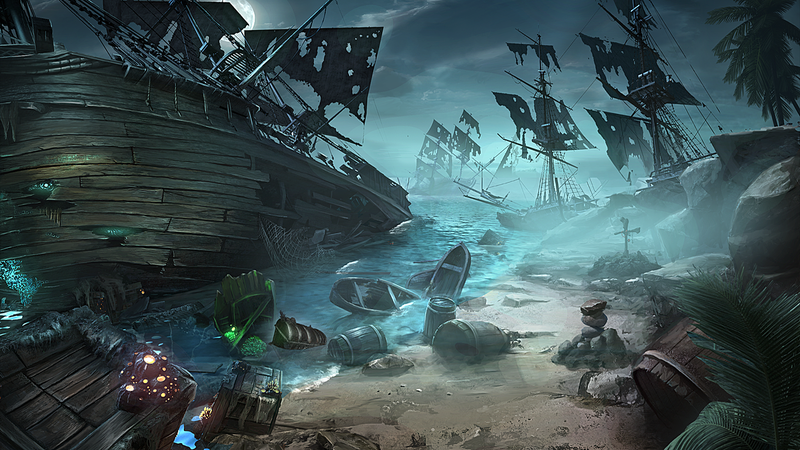 However, you quickly transition to the Haunted Pirate Island (TM) phase of the game, which makes up the bulk of it. If you know your pirate lore, you’ll be quite at home here. It’s a fairly thin and predictable plot, but it’s much more than I was expecting, so I was pleasantly surprised anyway. The graphics are pretty wonderful; the only complaint I have is that the model of your daughter looks a little stiff compared to the ghosts and pirates (probably because she’s the most realistic-looking model). Otherwise, the scenes are gorgeous, hand-drawn artwork. I was never confused about where to go or where to look because of the art (as I have experienced in some other hidden-object games), and there are enough varied environments that the art doesn’t become boring. Sound isn’t anything to write home about; voice-acting is just okay, but it’s not very important to the game at large and doesn’t come up too often. Even though I just finished playing the game for hours, I couldn’t hum you any of the soundtrack. The biggest problem I have with the sound is the over-use of jump chords; it’s a cheap way to get a scare out of something that wouldn’t be scary at all without a screeching violin. You can play the game in either regular or expert mode. 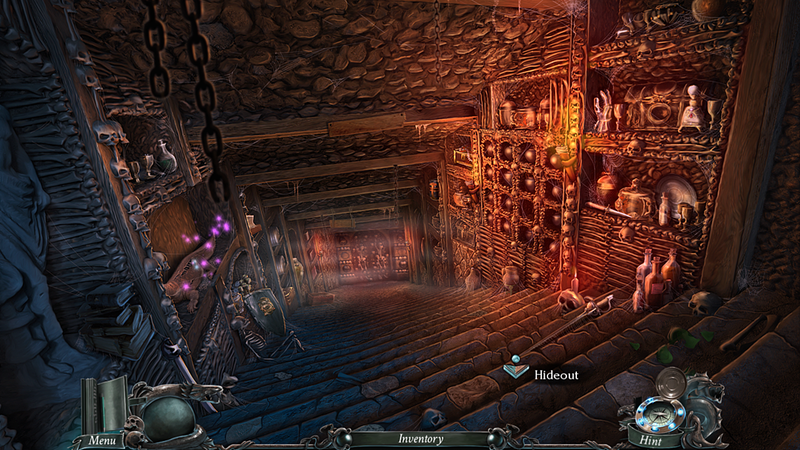 Regular mode offers no misclick penalty in hidden object scenes, active zones glimmering frequently, quickly recharging hint and skip buttons, and the map reveals locations with an available action. In expert mode, there is a misclick penalty, the hint and skip buttons take longer to recharge, active zones (except hidden object scenes) are not indicated, and the map does not reveal locations with an available action. I played in regular mode. Along with the very-useful map (it will save you a lot of aimless wandering! ), you also keep a journal of observations and tasks that will help you keep on track. I didn’t find myself referring to this very often, however. 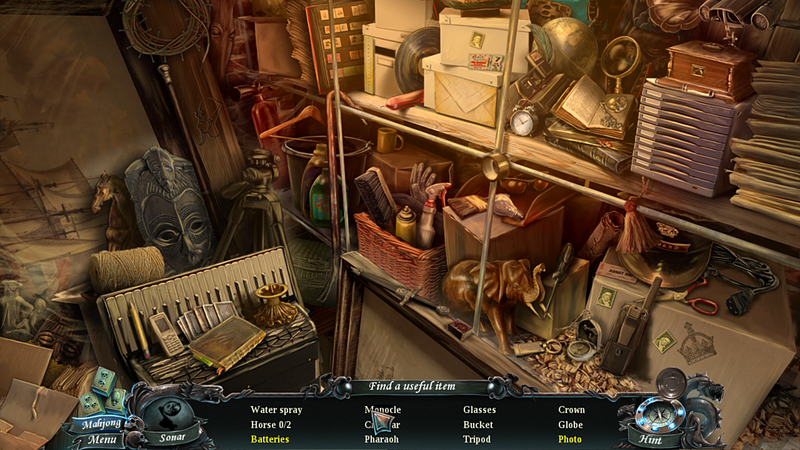 The gameplay is split pretty evenly between hidden object scenes, exploring, and solving puzzles. I really enjoyed that if you didn’t feel like doing a hidden object scene, you could play a game of mahjong instead; sometimes the searching can be tiring. I switched it up quite a bit over the course of my playthrough. Puzzles made sense, and if you get too frustrated, you can wait until your skip meter fills up and just skip the puzzle! You can’t do that with the hidden object scenes; for those, you have to use your hints (or just play mahjong). If you have the collector’s edition, after you finish the main game, you unlock a bonus game sequence (probably about 1/8th the length of the full game) that involves escaping from the island. Finishing that will let you play hidden object levels, watch videos, look at concept art, and get wallpapers of the game art. 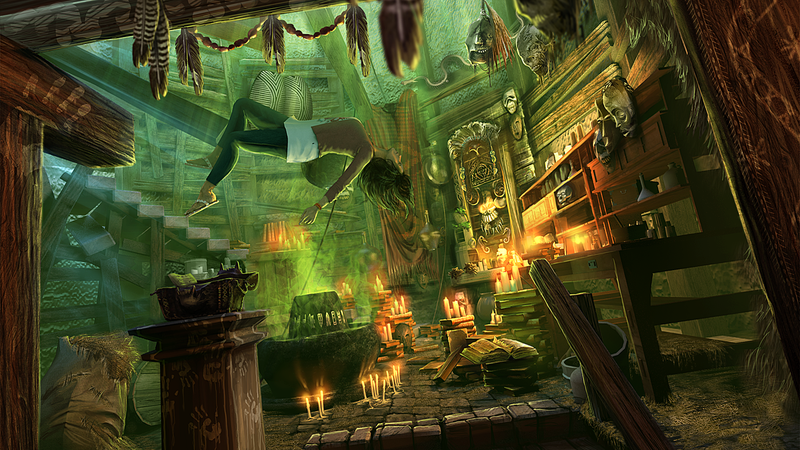 Nightmares from the Deep: The Cursed Heart was a thoroughly enjoyable game. It never lost my interest or frustrated me, and I would definitely recommend it, especially if you like finding things, solving puzzles, and/or pirates. You can currently get the game for Windows, Mac, iPhone, iPad, Android, Windows Phone 8, the Windows App Store, and Blackberry. Linux will be available if the game gets onto Steam. The game also has a sequel: Nightmares from the Deep: The Siren’s Call. The game comes in both a Standard Edition and a Collector’s Edition. Here’s a link to the Steam Greenlight page for the game! You can check out the official site, like Artifex Mundi on Facebook, follow them on Twitter and Pinterest, and subscribe on YouTube. There’s also a demo available!